If you’ve recently been to the doctor and found out that you have high cholesterol, you may be trying to make sense of the information. What exactly is cholesterol? What does it mean when your cholesterol levels are high? How does it affect your health? How can you lower it? First things first: What is cholesterol… It’s a waxy substance that your body uses to build cells, which is a good thing; however, when there’s too much of it, it’s a bad thing. Your body naturally produces the cholesterol you need, but it’s also found in a lot of foods that you might be consuming on a daily basis. When you’re taking in more cholesterol, especially in high amounts, there’s an excess, which can be bad. Cholesterol circulates through the blood, and as cholesterol levels rise, so do the risks to your health. There are actually two types of cholesterol: HDL is the good kind, and LDL is the bad kind. If you have too much of the bad type, or you don’t have enough of the good type, the bad cholesterol (the LDL) will accumulate around the interior walls of the arteries, which feed blood back to the heart and to the brain. This accumulation can narrow the arteries, reducing their flexibility. If the arteries are narrowed and a clot forms, you could end up suffering a heart attack or stroke. Of course, you don’t want to end up being the victim of such a devastating, life-threatening condition, so you want to make sure that you keep your cholesterol in-check and lower the bad type. How can you do that? – There are medications available, or, you can simply make changes to your diet. There are a lot of foods out there that have been proven to reduce cholesterol levels. By adding these foods to your diet, you can reduce your cholesterol levels and keep your heart – and the rest of your body – healthy. So, what foods help to lower cholesterol? Here’s a look at 20 different options that are a great way to naturally bring your cholesterol levels down. If you want to lower your cholesterol naturally, try adding some oats to your diet. By eating two servings of oats a day, you can lower your LDL (bad cholesterol) levels by as much as 5.3 percent in as little as 6 weeks! Oats contain bega-glucan, a substance that actually absorbs LDL cholesterol. Once it’s absorbed, your body secrets it. 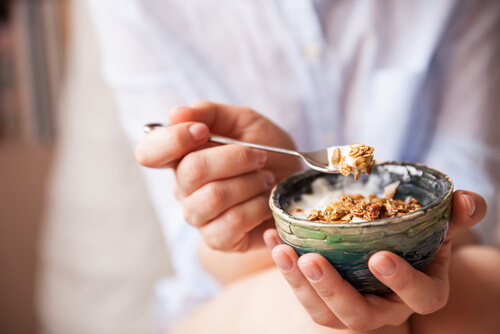 In addition to lowering cholesterol, oats are also packed with other valuable nutrients, including magnesium, fiber, phosphorus, zinc and selenium. Eat a bowl of oatmeal for breakfast and sprinkle some into yogurt for an afternoon snack.